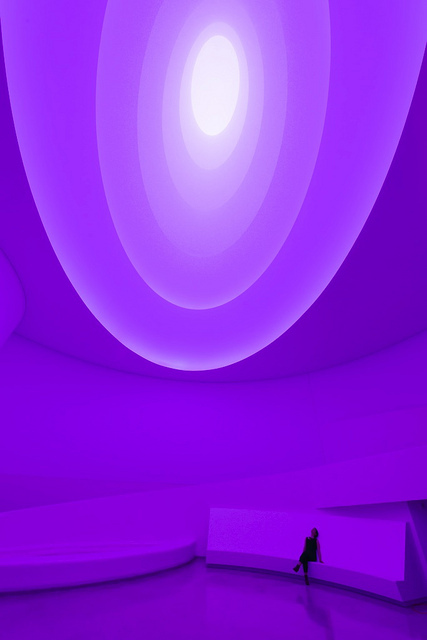 For our third annual Halia Hope Wertheimer Memorial Outing, my teenage son and I took a day trip to New York City to see the James Turrell exhibit at the Guggenheim. Fittingly, the exhibit opened on Halia's birthday, and it closes on September 25 so we just got in under the wire. It was an amazing exhibit, though not easily described in words. We were obedient and did not take any photos of the exhibit itself, but there are plenty to be found around. They can't capture the dynamic nature of the exhibit, but the photos are interesting and beautiful and give a little idea of what it was like. I wished that I could have had the exhibit to myself for a day. It was so mesmerizing and meditative. As it was, I was with a sometimes antsy thirteen year old and hundreds of other people! Still, for a few spells, I let myself sink into the work and be carried away by the shifting light and optical effects.